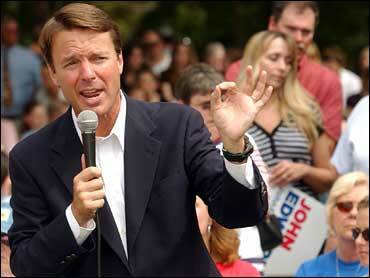 Democrat John Edwards called Friday for new restrictions on the use of private contractors to provide security services in combat areas, including blocking such companies from giving to political parties and candidates. Edwards linked his proposal to charges that the company Blackwater USA had engaged in random violence in Iraq that's led to the deaths of innocent civilians and prompted a congressional investigation. He also charged that Mark Penn, a top adviser to rival Hillary Rodham Clinton, has done work for Blackwater. "We don't want to replace a group of corporate Republicans with a bunch of corporate Democrats," Edwards said in a telephone interview with The Associated Press. Edwards said his plan would virtually eliminate the use of private contractors to provide security services and would put sharp restrictions when such services are allowed. Private forces have spiraled out of control, Edwards said, with more than 50,000 operating in Iraq with few restrictions or oversight. "They don't have rules of engagement and they don't have legal oversight," Edwards said. Those private security forces allowed under Edwards' plan would be within the Pentagon chain of command, he said. Edwards said private security firm undercuts the accountability of the nation's volunteer military. "It undermines the purpose of having a volunteer army," said Edwards. Edwards said his plan also would ban private security companies from donating to politicians because such contributions played a role in the Blackwater situation. He argued that Blackwater won lucrative contracts in Iraq after becoming a reliable contributor to the GOP. "Blackwater has given hundreds of thousands of dollars to Republicans and to President Bush," said Edwards. Edwards released his plan as he opened another intensive campaign swing through Iowa, planning stops in 17 counties over four days. Most polls have shown him near the top of the Democratic field in Iowa, along with Clinton and Illinois Sen. Barack Obama. Clinton, however, leads in national polls and Edwards is betting his campaign on a solid showing in Iowa's precinct caucuses, giving him a boost heading into New Hampshire and other early voting states. In this Iowa visit, Edwards will focus on his proposal to immediately pull as many as 40,000 troops out of Iraq. He said Blackwater's problems offer one more example of how Bush has mismanaged the war. "The recent incidents of violence involving Blackwater contractors in Iraq, including the shooting of Iraqi civilians in Baghdad last month, has caused tremendous damage to America's battle for the hearts and minds of Iraqis," said Edwards. "These incidents hurt America's moral standing both in Iraq and around the world, and they serve as a tragic reminder of how the Bush administration has outsourced our military responsibilities to corporate contractors and political cronies who operate outside the rules of engagement and without any meaningful oversight." Edwards said Blackwater's role has expanded well beyond traditional security to include loading weapons systems and sometimes engaging in combat operations. Those forces can't be allowed to operate outside the chain of command and without control by the judicial system, he argued. Iraqis don't distinguish between soldiers and civilians, he said, but simply see excesses committed by Americans.